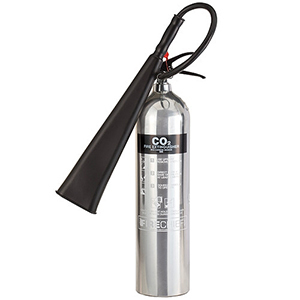 The 5kg chrome CO2 fire extinguisher is made from highly polished lightweigh aluminium and is ideal for design led or architecturally sensitive environments. As well as this it is perfect for clean rooms or hygienic environments too. 5kg CO2 Fire Extinguisher with frost free horn which is suitable for situations involving flammable liquids and electrical hazards. CO2 is harmless to delicate equipment and materials. Ideal for all modern office environments, all electrical risks and where oils, spirits, solvents and waxes are in use. Not suitable for use on Class A fires (wood, cloth & paper).